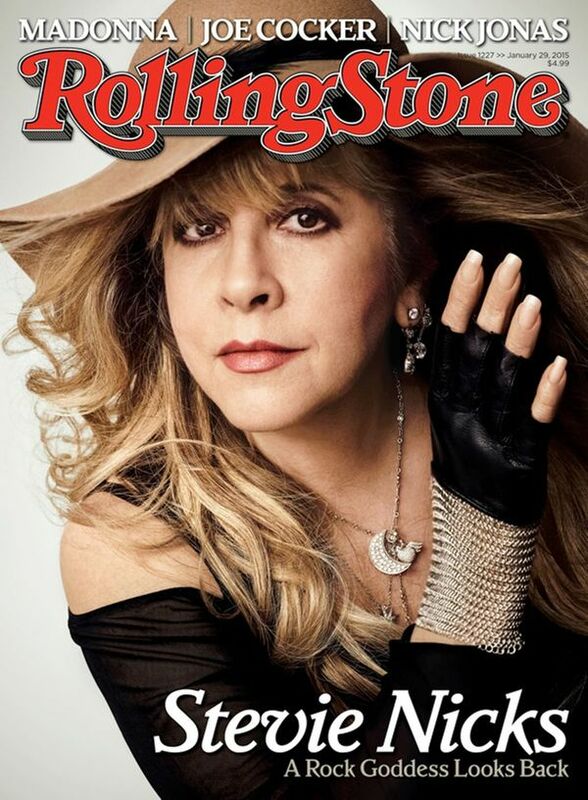 Check out Stevie Nicks on the latest issue of Rolling Stone. Read the full article below, or head over to rollingstone.com for more info. But Nicks has never really felt like she could leave Fleetwood Mac, other than for a few years in the Nineties. "We choose to stay," she says. "Because we can't do anything else. None of us are ever going to stand up and say, 'I'm going to make my own choice for the first time in my life, and I'm going away, and I don't know if I'm coming back." Click here to watch a performance of "Gypsy" that Nicks recorded exclusively for Rolling Stone, which marks the first time she's ever played the song stripped-down and nearly a cappella. Nicks' coke habit was truly life-threatening. "All of us were drug addicts," she says. "But there was a point where I was the worst drug addict. . . . I was a girl, I was fragile, and I was doing a lot of coke. And I had that hole in my nose. So it was dangerous." "I did all I could to talk her into getting some help and getting right," says Tom Petty. "I was very worried about her. To the point that if the phone did ring and they said, 'Stevie died,' I wouldn't have been surprised." Nicks never considered herself an alcoholic, and she still smokes a bit of weed, albeit as a creativity aid. "When I'm writing, I will allow myself to smoke a little bit of pot," she says. "It's my one little thing that I can do. I use it as a tool, and I'm very careful, you know? And I get results. However, if I thought it was going to lead me back to something worse, I'd stop." The tension between Nicks and Buckingham never goes away. "Relations with Lindsey are exactly as they have been since we broke up," says Nicks. "He and I will always be antagonizing to each other, and we will always do things that will irritate each other, and we really know how to push each other's buttons. We know exactly what to say when we really want to throw a dagger in. And I think that that's not different now than it was when we were 20. And I don't think it will be different when we're 80." The moment Nicks joined Fleetwood Mac, she decided she would never think about money again. "I said, ‘That's it, I'm never looking at another price tag,' " she says, laughing. "And I meant it." Nicks quietly dated a younger guy – a handsome waiter – in the Nineties, and it didn't work. "One day, he came home and said, 'I got two tickets for Bill Maher, will you go with me?' and I'm like, 'Are you insane? No. I'm not going. I'm famous! I'm Stevie Nicks! Everybody's gonna spend the whole time taking pictures of us. And I can't keep on making excuses about why you can't go anywhere I can go. Like, can I take you to the Grammys? No. Can I go to the market with you? No. Can we go to a movie together in downtown Santa Monica? No. All we can do is stay in.'" She doesn't really want to date older men: "What if I fall in love with somebody and they die?" And she doesn't hold out much hope for guys her age. "They wanna go out with somebody that's 25," she says. "That has been going on since the Bible, and I haven't even read the Bible, but I know that. So what am I gonna do, compete with that? I'm not a competitor. So I don't even wanna be in that situation." So, in short, "I've narrowed it down to nobody," she says, and laughs hard.